— The Buffalo Bills dropped the 2012 season opener, 48-28, to the New York Jets at MetLife Stadium on Sunday. QB Ryan Fitzpatrick finished the day with 195 yards on 18-of-32 passing with three touchdowns and three interceptions. RB C.J Spiller tallied a career-high 169 yards on 14 carries, including a career-long 56-yard touchdown. WRs Donald Jones and Stevie Johnson each notched touchdown catches, along with TE Scott Chandler. On defense, LB Bryan Scott recorded an interception early in the first quarter. — Became 24th player in Bills history with 1,000+ career rushing yds. — Made second career appearance in season opener … also started in 2011 opener, going 17-of-25 for 208 yds. with four TD & 0 INT at K.C. — 5-of-8 for 58 yds. on 4th qtr. TD drive which reduced Jets’ lead to 41-21 … drive, which ended with 6-yd. TD pass to Donald Jones, consumed 96 yds. on 13 plays and used 6:14 of clock … 96-yd. drive was longest by Bills since 96-yd. drive (using 7 plays), 9/25/11 vs. N.E. … 13-play scoring drive was longest by Bills since 15-play trek (covering 80 yards) 12/4/11 vs. Ten. Buffalo rallied for 20 fourth quarter points to upset the N.Y. Jets, 20-17, in front of a War Memorial Stadium record crowd of 45,748. Before we start questions, a bit injury wise, both of them were knees. Fred (Jackson) doesn’t look as bad as David (Nelson). We don’t know how bad David is but it doesn’t look good right now. Fred doesn’t look nearly as bad but we are going to get a further evaluation tomorrow. We made too many mistakes early to get in the ball game and we have got some things we have got to work on and I understand that. It hurts. It is no fun. It is awful, all of the above. This is a cliché and I understand it. It is one (game) of 16 and if you win enough, you get in the playoffs. This was a learning experience and if you don’t, then it was the start of something bad. That is the bottom line. I understand that. I think our football team understands that, but we are not going to go around like the sky is falling. We are not going to do that. I am not going to do that and I am not going to let them do that. We didn’t show it today. There were some things that we did better, but overall we didn’t show it today, but I think we have a chance to be a good football team before it is over with and nobody will change my mind until we get to the end. He had a couple of huge runs. He made some big plays which we saw last year. He is capable of doing that, almost made another big one on the pass. There were some positive things out of him and we know what we have got in him, and we are going to keep running him because we can score as fast with him running it as we can throwing the football. We don’t mind that at all and it was a good job by him and we are going to have to rely on him a lot more until we get Fred back. Really bad early. Some of those I put him in bad situations with some play calls. After we got past a couple of those bad situations, he did some decent things. Overall it was not a good day. It was a bad day for him. Well, my offensive line did a great job of hitting those guys up and (forming) the seam that I had to keep the front side from the blitz that they were bringing. The receivers and tight ends were doing a great job blocking downfield. We always said it’s going to be one man that we have to beat. I saw 30 (LaRon Landry) and the way he was trying to play it, I just knew I had a chance, got running and broke a couple of tackles and was able to get in the end zone. I didn’t think it was, but the refs, they call what they call. I didn’t think I totally had possession of it, but I just have to do a better job of bringing it in. My quarterback did a great job of putting it right where he’s been told to put it through training camp and in preparation for this game. It’s my job to bring it in so I can’t leave it up to the refs. I just have to get better at that this week and the rest of the season. Bills RB C.J. 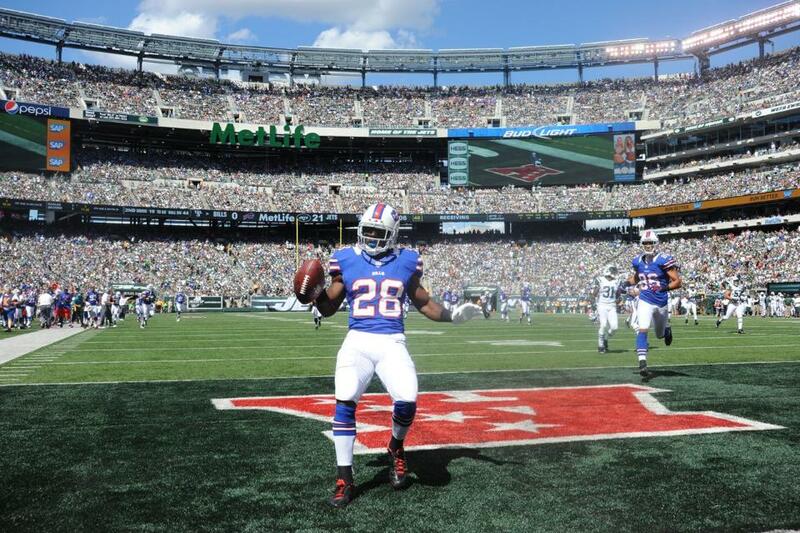 Spiller rushed for a career-high 169 yards, including 56-yard touchdown, on Sunday.